C2G connectivity is constructed with quality in mind for durability and reliability. The C2G High Speed HDMI with Ethernet Cable is perfect for home theater or desktop audio video applications requiring high speed HDMI features and video resolutions up to 4k (2160p). 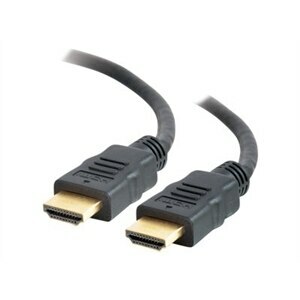 The Ethernet capabilities of the cable allow a user to connect multiple Ethernet enabled HDMI devices through a single Ethernet connection for accessing interactive online content or updating device firmware. This fully-functional, high bandwidth cable is tested to perform at industry standards and is backed by a lifetime warranty. This cable can be utilized for network switch stacking with compatible equipment. Experience the latest HDMI features including 4K@50/60, (2160p), which is 4 times the clarity of 1080p/60 video resolution; 3D video, Deep Color and x.v. Color; Dolby True HD, DTS-HD Master Audio and up to 32 audio channels for a multi-dimensional immersive audio experience; Up to 1536kHz audio sample frequency for the highest audio fidelity; Simultaneous delivery of dual video streams to multiple users on the same screen; Simultaneous delivery of multi-stream audio to multiple users (up to 4); Support for the wide angle theatrical 21:9 video aspect ratio; Dynamic synchronization of video and audio streams; CEC extensions for control of consumer electronics devices through a single control point.